I was much more happy with my score in Round 2 than Round 1. I ended up with 69 and by Davis captain netted me 12. Yeah it would have been nice to get a goal or assist, but I’ll never snub my nose at a 6. Overall, it was a good round….until the injuries and suspensions started to come. More on that below. Hindsight, should have used my WC. Keepers – No change here. I’m sticking with my original plan. Kronberg is home this week and playing against a SJ team that went 120min during the CCL game. I like his changes for a good return. Defenders – One of my headache spots this week. Traded out Kah for Armando, Kah looks like he’ll start and Armando got suspended, Remick may finally be on the bench this week, and Marshall is still carrying that orange flag (thought he has been practicing). In the end, I decided to run with what I had. The Armando trade was actually my 3rd of the Round so I took a -4 for that, but that was part of my plan so I was not concerned. Midfielders – Unfortunately, I did start to get concerned when the midfielder suspensions came. I had planned to drop Davis week and replace him with my differential pick Salinas, unfortunately, Dempsey got a 2 game suspension and I needed to replace him. My only real sub is McNamara, but with 2 defensive concerns already, I had to take another -4. 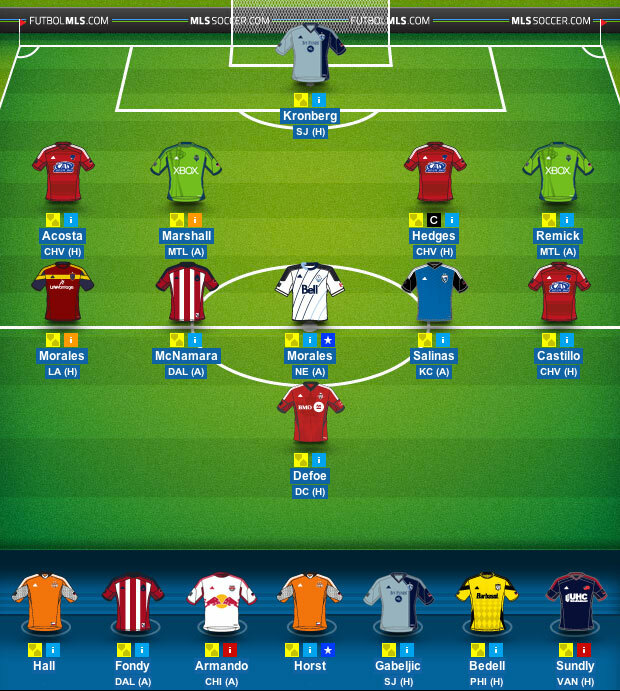 In the end, I decided to take a risk and brought in Javier Morales. Javi may not play all of this game, but I’d be surprised if he missed it all. I’d rather have a portion of Javi’s two home game than play Bradley (my other option) for one and and have to trade him out. Forwards – I, like many others, liked what they saw in Defoe last week. I think he has a good chance for more points against DC so I’m willing to take a 1 Round shot at him. Bench – As I said, I had to bring in McNamara this week and that leaves Fondy as my only sub who could see some time. Unfortunately, since the MTLvSEA game was moved to Sunday, I will not be able to see the lineup before Chivas. Going to have to be a judgement call. Captain – Until about 20min ago I had Defoe. But right before I wrote this article I decided to go with Hedges. Two goals from Defoe seems like a stretch, so if I think 1 goal at best, I’m looking at 7 points. Hedges has a shot at a clean sheet, so that could be 6 points + whatever defensive bonus points he gets. It’s not a huge difference, but I decided to go with it.